The UFCW Western States Council is proud to recognize the hard work and dedication of elected officials, UFCW members, and allies. The Person of the Year celebration was held in Phoenix, Arizona on September 21st. The UFCW Western States Council’s Person of the Year is someone that embodies the hopes and dreams of many, leads by example and paves the way for others. Someone that stands with you not only in times of celebration but also through hardship. Someone that is a champion for workers and is committed to improving the lives of working families. 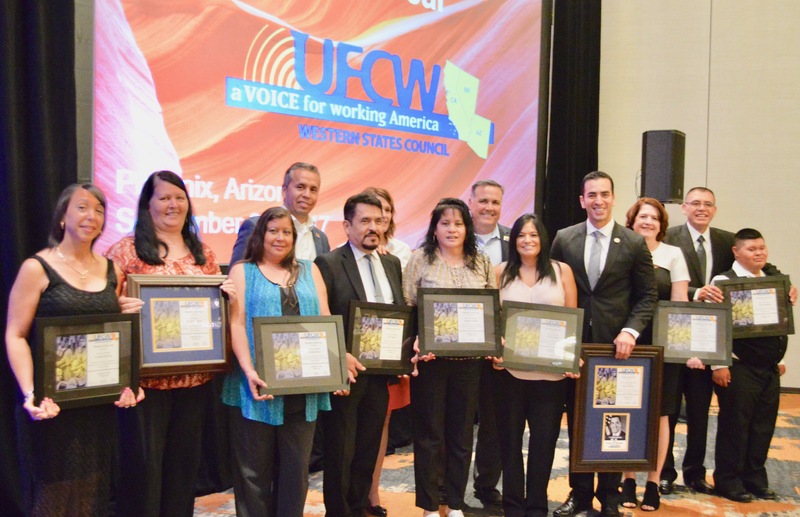 2017 UFCW Western States Council Person of the Year is Congressman Ruben Kihuen from Nevada. Kihuen is a central figure in the next generation of political leadership. UFCW has amazing members. They are leaders among their co-workers and communities. We recognize and appreciate the work and commitment they demonstrate day in and day out. The 2017 UFCW Western States Council’s Members of the Year are UFCW Local 99 Noble Nine: Cynthia Del Sol, Cesar Escobedo, Joe Fonseca, Amparo Gómez, Gayle Lutz, Cynthia Reyes, Cindy Vargas, Annette Jacobsen-Yastrzab, Pedro Albarrán, UFCW 770’s, Javier Ybarra, UFCW 324. UFCW Western States Council strives to build partnerships with labor, community, grassroots and non-profit group. Strength is garnered through collaboration. SEIU California has been a key partner in aiding our efforts to pass cannabis legislation and elect a champion for workers in the Inland Empire (Assembly District 47) by electing Eloise Reyes. Thank you SEIU California for the strong partnership we have created for progressive politics in California and congratulations on being the recipient of the UFCW Western States Council Solidarity Award! Congratulations to all the award recipients. We greatly appreciate their relentless commitment to improving the lives of working men and women and their families.